As the fog filled the woods surrounding the yard, I noticed Copper hanging out near the fence among the thick tall ferns. It was 5:30 and very unusual for him to be up that early. He, like the Pres, usually sleeps later. In fact, I thought that he may have not been feeling well so I continued to watch him. Exiting the fern cover and slowly walking up toward the house, I noticed he had something in his mouth. Almost tiptoeing up the hill carrying it ever so gently although I couldn't make out what it was. So I watched...window to window, room to room until I saw him place it on the ground past his house and not far from the deck yet far enough away from Moon's house. As the slider opened he looked up at me with an "am I in trouble?" look. Smiling I said, "what have you got there handsome? I'll be right out." Approaching his catch, I could see what it was...an opossum, playing opossum as I saw it breathing steadily and knew it was not hurt. Loosing interest, Copper went to his breakfast and proceeded to chow down as did Moon. Meanwhile, I went about my business too, digging ferns to bring to my SIL the next day. That opossum remained on it's side for at least an hour. Then, as I was about to water a freshly dug fern, I noticed it was now on all fours, head lowered as I approached. I wanted to burst out laughing!! 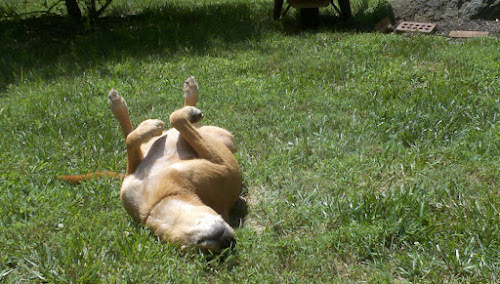 Copper was out like a light in the shade and showed no interest at all in his prize. I figured if we all ignored it, it would just get up and move on. I was outside from 6:00 and it was now 8:45 and I was starving so I headed in. Besides I'd heard the Pres and knew he was up. Telling him what happened as I stepped into the sunken dining room and gazed out the slider, I watched the opossum slowly lift it's head, do an about face and tip toe toward the woods...a mere twelve feet away...then sneak through the fence into the deep woods for safety. Copper? He was still napping in the shade! Later that morning, Copper walked over to the spot where he left his prize, sniffed around, then walked back to the shade of his favorite tree. Of course, he had to stop and scratch his back on the grass first. How great was that.. I think copper had no intention of killing the opossum just wanted to play with it. We enjoy watching those little scenes here too. As long as it isn't a kitten or a chicken that has Sugar's interest! Now there is one happy dog. He likes the idea of the chase!